The Nevada Quick Divorce are experts and qualified paralegals offering specialized services in marriage annulment and divorce decrees. For over 26 years we have been a leader in obtaining signed decrees in only 1 or 2 days! The Nevada Quick Divorce Experts want to save you time and money by doing all the work. The Nevada Quick Divorce Experts can save you hundreds of dollars by preparing your family legal documents instead of an expensive attorney. 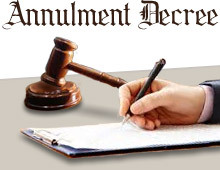 We are registered professionals dedicated to providing fast and affordable services with legal document preparation for those seeking an annulment to their marriage. Complaint Annulment – $490 plus filing fee plus cost for service if only 1 party signs. Even if an initial basis for annulment is established, other factors may limit a couple’s ability to have their marriage annulled in Nevada. In any case, separation from your spouse is always difficult, and we are here to help you through this difficult time. The Nevada Quick Divorce Experts will help you to determin whether or not you qualify by using a reliable qualifications process and determining the outcome based on the criteria that you supply. Because family laws governing the dissolution of marriage in Nevada can be complex, it’s important to seek advice from a qualified professional when considering an annulment. Remember that we are here to help, and instead of relying on your own wisdom, let us do the work by determining the grounds for your annulment, preparing the paperwork, and finalizing the documents. Call the Nevada Quick Divorce Experts, we are here to help you get through the process 1-877-787-8270, or review Annulment Qualifications. If you seek a divorce review Nevada Divorce. “The Nevada Quick Divorce Experts will cancel your marriage and both parties are returned to your marital status before the marriage.” We are ready to provide you a free consultation! Contact the Nevada Quick Divorce Experts today, we can help!